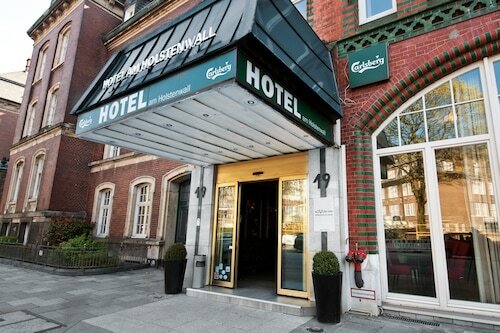 This hotel offers a convenient location across from the Hamburg Museum, about 3 blocks from the Reeperbahn, and 0.4 km (0.2 mi) from St. Michaelis Church. The Rathausmarkt is 1.3 km (0.8 mi) away. 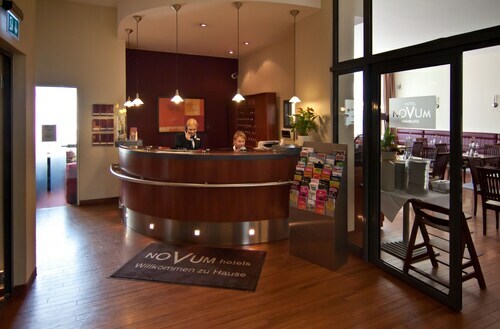 In the St. Georg district, Hotel Eleazar Novum is a 5-minute walk from Hamburg's main train station. Hamburger Kunsthalle, St. Jakob's Church, and Monckebergstrasse are all within 0.7 km (0.5 mi). Located in Neustadt, this eco-friendly hotel is within a 10-minute walk of Jungfernstieg and Hamburger Dom. Hamburg Messe and Congress and Congress Center Hamburg are also within 1 mi (2 km). Hamburg Dammtor Station is 10 minutes by foot and Sternschanze Station is 22 minutes. 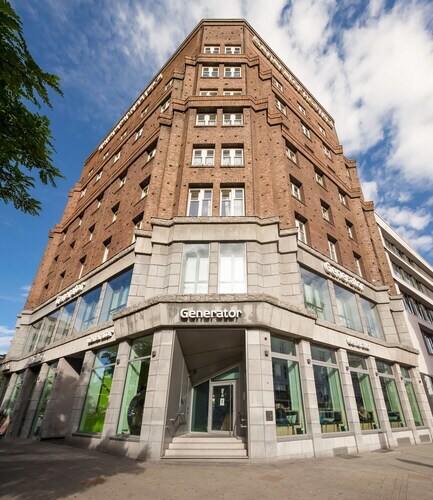 A&O Hamburg City is a 15-minute walk from Hauptbahnhof (central station) and 5 minutes from the nearest S-Bahn stop, Hauptbahnhof. The shops of Moenckebergstrasse are a 12-minute train ride, the harbor 15 minutes. 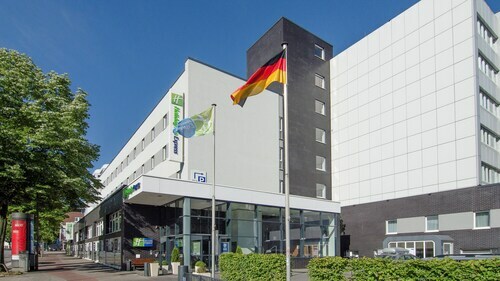 Located in Hammerbrook, this hotel is within a 15-minute walk of Huhnerposten Events Location and Hamburg Wholesale Market. Miniatur Wunderland and Hamburg Dungeon are also within 1 mi (2 km). Steinstrasse U-Bahn is 8 minutes by foot and South Central U-Bahn is 12 minutes. 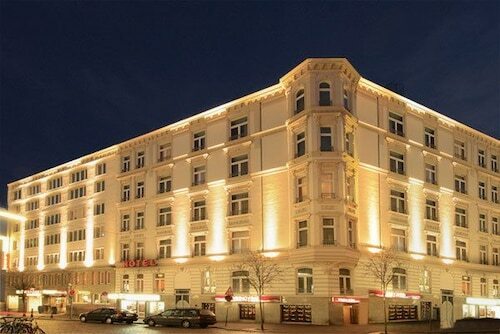 Located in Altona, this hotel is within 1 mi (2 km) of Beatles Platz, Reeperbahn, and Fish Market. Theatre Neue Flora and Operettenhaus are also within 2 mi (3 km). Altona S-Bahn and Hamburg-Altona Station are within a 5-minute walk. 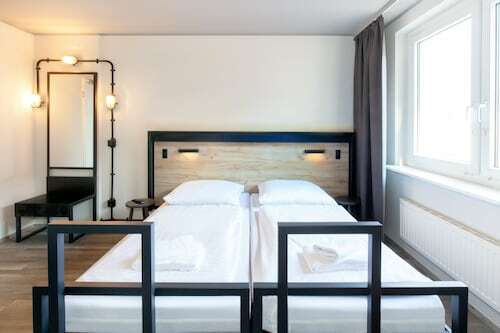 Located in Saint Georg, this hostel is within a 10-minute walk of Museum of Arts and Crafts Hamburg and Moenckebergstrasse. Hamburg City Hall and Hamburg Wholesale Market are also within 1 mi (2 km). South Central U-Bahn is only a 2-minute walk and North Central U-Bahn is 4 minutes. 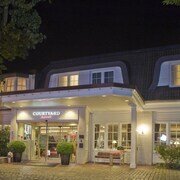 Located in Saint Georg, this hotel is within a 15-minute walk of Museum of Arts and Crafts Hamburg and Moenckebergstrasse. Hamburg City Hall and Hamburg Wholesale Market are also within 1 mi (2 km). South Central U-Bahn is only a 4-minute walk and North Central U-Bahn is 6 minutes. Despite its beautiful lakeside setting, Fairmont Hotel Vier Jahreszeiten places guests close to all the culture and commerce of central Hamburg. The Hamburg State Opera is a 4-minute walk, and it's only a little further to Gänsemarkt Metro Station, connecting guests to the entire city. 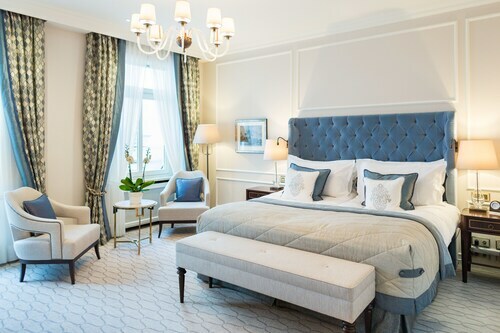 This palatial hotel rises along the Outer Alster River, two blocks from the Hamburger Kunsthalle (art museum) and the National Theater; Hamburg Messe is one km away. 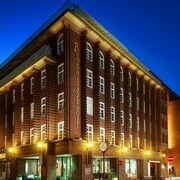 In the heart of Hamburg, this waterfront hotel is a two-minute walk from the Rathaus (City Hall) and a U-Bahn station. Monkebergstrasse shopping and St. Michaelis Church are 0.7 km (0.5 mi) away. 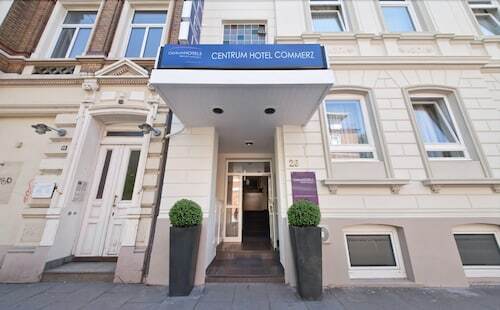 Located in Altstadt, this luxury hotel is within a 10-minute walk of Moenckebergstrasse and Hamburg City Hall. Miniatur Wunderland and Hamburg Dungeon are also within 1 mi (2 km). Monckebergstrasse U-Bahn is only a 2-minute walk and Central S-Bahn is 6 minutes. How Much is a Hotel Room in Hamburg? 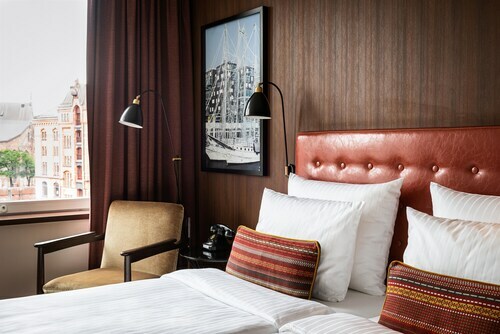 Hotels in Hamburg start at $50 per night. Prices and availability subject to change. Additional terms may apply. Although it's often overshadowed by its big brother Berlin, the city of Hamburg in northern Germany is worth a visit as well. Its status as an industrial port doesn't damper the city's appeal so much as bolster it. Hamburg is a classically beautiful industrial center with plenty of activities that keep visitors coming back. After all, it has been responsible for such international exports as—you guessed it—the hamburger. Hamburg has scores of theaters, music venues, and clubs. The city is home to a UNESCO world heritage site called Speicherstadt, a historic warehouse district where the buildings rest on oak logs. St. Michaelis Church is a popular sight that offers city-wide views from the top of the tower. Tourists can also visit the Hagenbeck Zoo or take a tour of the Elbe River. Hamburg Mitte, the city's central neighborhood, is the best place for tourists to sightsee and shop. 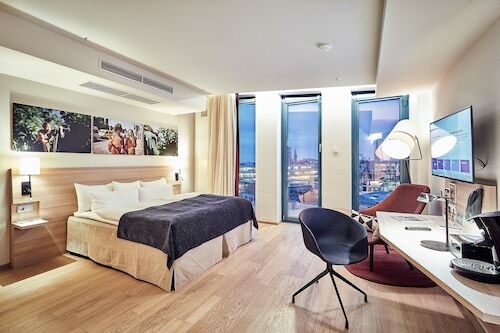 Hamburg hotels in or near this district will give visitors the best access to activities and nightlife. The Reeperbahn, the former Red Light district that boosted The Beatles' early career, now boasts an eccentric yet hip blend of theaters and galleries side by side with its high-end restaurants. Many restaurants in the area feature international dishes, even though Hamburg is famed for its unique cuisine. Classic dishes like Birnen, Bohnen und Speck (a stew made of pears, beans, and bacon) and Aaulsuppe, or eel soup (which may or may not actually contain eel) are regional specialties. The nearby Baltic Sea provides much of the fresh local seafood that fills menus in Hamburg. Can't wait to try some? Then use Travelocity to search over 400 airlines and more than 510,000 hotels worldwide to find cheap hotels in Hamburg. Travelocity can help you book Hamburg vacation packages that include flights to Hamburg and hotels in Hamburg so you can travel stress-free. Restaurant and Bar configuration very confusing. Where to enter tge restaurant?? Not a good hotel, would not stay there again. The only two good things were: very pleasant staff and very close proximity to the train station. The rest was bad: pillows and blankets are tiny and not adequate (I had to fold the pillow four times to get it not to be flat); shower water would change the temperature on a whim; room would be either too cold or too hot -- no constant temperature; and most importantly -- the windows of the room face the street and it was very loud-- there were always someone talking, singing, fighting, cursing, etc. outside of the room and we would hear all of that. Similarly, we could hear everything that was going on in the corridor. The breakfast was ok, though. 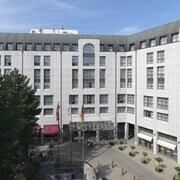 We picked the hotel because it was near the Hamburg train station That turned out to be good and bad. When we walked to it, the area outside the front was extremely dirty and there were vagrants sleeping by the front door. The hotel itself was very nice; our room was good sized and comfortable as was the bathroom. Only complaint was the shower floor was extremely slippery and they couldn't do anything about it. Very dangerous. It was June so our room was extremely stuffy and warm and we had to open the balcony door for air. (There was no central air and they had no fans) The noise level outside was so loud we could barely hear ourselves. The number of people that sat and talked all night outside the front of the hotel was huge; they didn't just talk, they yelled at each other. Thank goodness we had ear plugs but even that didn't drown out everything. Being in the city , we expected noise but not to this level. I did not feel very comfortable going in and out of the hotel. The hotel was near to lots of nice restaurants and not far from many sites in Hamburg. Breakfast was ok but not as good as other places we stayed. Nice hotel convenient to the harbor area and other areas of tourist interest. Room size and layout was clean, but cramped; bedding and linens were institutional at best. No hotpot, iron, laundry services, or any convenience that a business traveler would need. No air conditioning or fan made the room sweltering. Cramped shower w/awkward faucet made showering more like a yoga challenge. Rate did include breakfast, which was basic but adequate if for no other reason than coffee was available. Staff showed a minimal amount of courtesy once my card was charged for the full amount of my stay. Compared to its next door neighbor, this hotel was a huge disappointment. We booked a room with a king size bed, knowing we would be there about 2 weeks and wanted a little more comfort. We received a queen bed, and when we inquired about the discrepancy were told that the hotel had no king sized beds at all. Frustratingly, both this booking site and the hotel's website (which does show a king size bed) make it too hard to determine if we paid a higher rate for the mythical king size bed. The room was ok - basic and clean, but the beds were not comfortable at all - so after 2 weeks it took a toll.